Switching to an efficient showerhead is one of the easiest ways to conserve water and energy in your daily life while also saving money on your utility bill. The latest showerheads use 1.5-2 gallons of water per minute, while showerheads manufactured before 1994 use 3-8 gallons per minute. That means a family of four could save about 3,600 gallons of water and $60 in utility costs per year simply by using efficient showerheads. To help you save money and use less hot water, we offer up to $5 off the purchase of a water-efficient showerhead. Just look for one with a Tacoma Power sticker at any participating store and receive an instant rebate at the time of purchase. 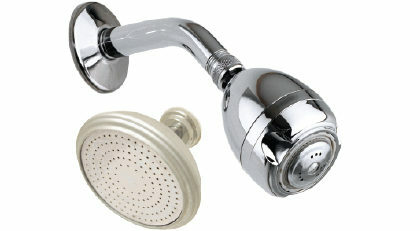 You can also receive a free water-efficient showerhead at the TPU Administrative Services Building at 3628 S, 35th St. Learn about more ways to save water, energy and money. Program requirements and rebate amounts are subject to change without notice. Check with us for current information. Energy and heating savings are estimates only. Actual savings may vary. Tacoma Power does not make any representations, promises or warranties with respect to actual cost savings from any of the products. Tacoma Power does not endorse any particular contractor, manufacturer or product.